Say hello to The Guardian. This prominent figure greets you as you enter the Canyon Pintado National Historic District from the south. Located at the White Hands site, it’s a very short walk to visit this pictograph along the highway. Is this anthropomorph Barrier Canyon Style or is it Fremont? 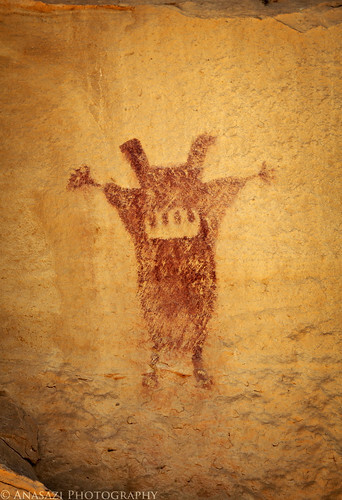 According to the interpretative sign below, it is believed that this figure might be from a transitional period between Barrier Canyon Style and Fremont. Either way, this is a very unique pictograph in a highly visible location.